SEOUL, South Korea — After holding consecutive summits with soaring but empty rhetoric, the two Korean leaders in their third try finally produced some substance. According to a joint statement released by Seoul, North Korea agreed to permanently dismantle a launch pad and an engine-testing facility at its northwestern rocket-firing center in the presence of international experts. The North also said it could take further measures such as permanently dismantling its main Nyongbyon nuclear complex if the United States takes reciprocal measures. While symbolic, the dismantling of the missile engine test site and launch pad wouldn't represent a material step toward denuclearization of North Korea, which after a torrent of weapons tests last year declared its nuclear force as complete. The North has invested much effort to improve the mobility of its most powerful missiles, which are designed to be launched from vehicles. The level of access foreign experts will have at the North Korean sites is also unclear. 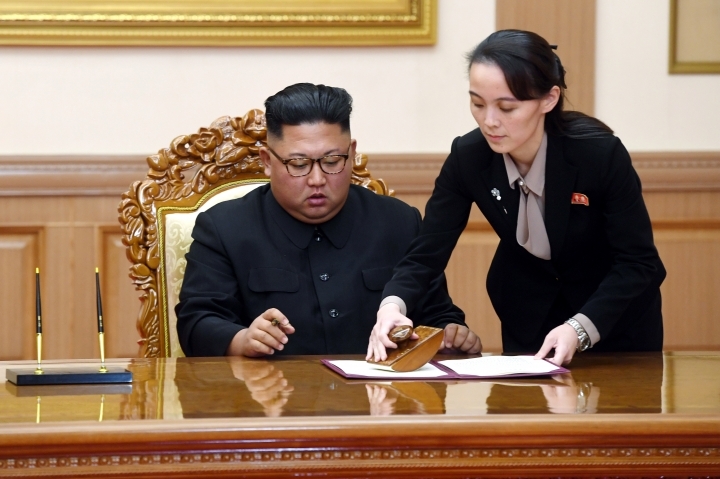 The move wouldn't be entirely meaningless if Washington and Seoul could successfully argue that, in allowing outside experts, Kim accepted in principle that agreements should be verified. This could make it harder for Kim to reject inspections once the denuclearization process proceeds. The North unilaterally dismantled a nuclear testing ground earlier this year, but didn't invite experts to observe the event. Still, the discussions on the North's denuclearization continue to fail to answer the basic questions of what, when and how. 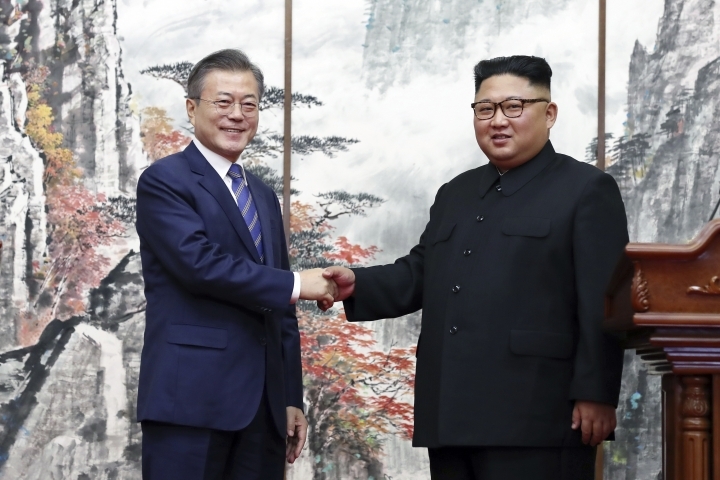 In the joint statement, South Korean President Moon Jae-in and Kim repeated their previous goals by saying that the Koreas would "closely cooperate in the process of pursuing the complete denuclearization of the Korean Peninsula." The North for decades has been pushing a concept of denuclearization that bears no resemblance to the American definition, vowing to pursue nuclear development until the U.S. removes its troops from South Korea and the nuclear umbrella defending South Korea and Japan. Some experts say that Washington is trying to shape the nuclear talks as a bilateral arms reduction negotiation between two nuclear states, instead of a process to surrender the North's nukes. Kim in a news conference said that the Koreas will work toward turning the peninsula into a "land of peace with no nuclear weapons and no nuclear threat," but that's hardly a departure from its traditional stance. The Korean leaders' vague statement did not include a timeline despite South Korean officials earlier saying that Kim expressed a desire to denuclearize within President Donald Trump's first term. "The only firm promises North Korea made was to permanently dismantle the missile engine test site and launch pad," said Cheong Seong-Chang, a North Korea expert at South Korea's Sejong Institute. He said the statement is unlikely to satisfy hawks within the Trump administration calling for the return of the pressure campaign against the North. The steps to reduce tensions announced after the summit are mostly new and could help bring down the danger of accidental clashes between the rivals, whose combat-ready troops face each other along the world's most heavily fortified border. But the fate of this kind of inter-Korean agreements is largely the subject to nuclear negotiations between the United States and North Korea. 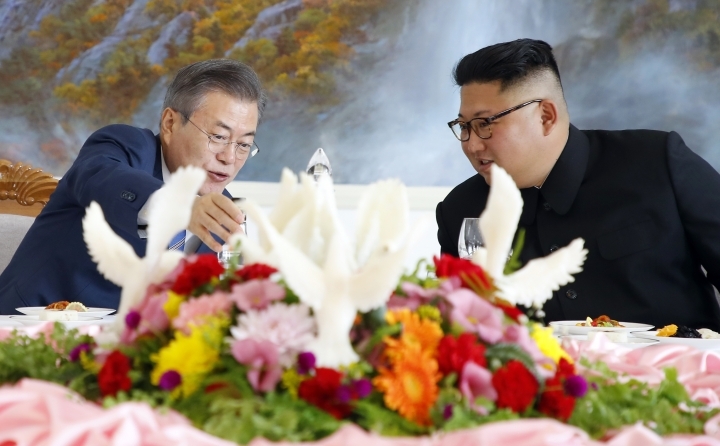 Also, some experts question whether a hasty mutual reduction of conventional military strength while leaving the North's nuclear assets largely intact would be beneficial for South Korea's national security. 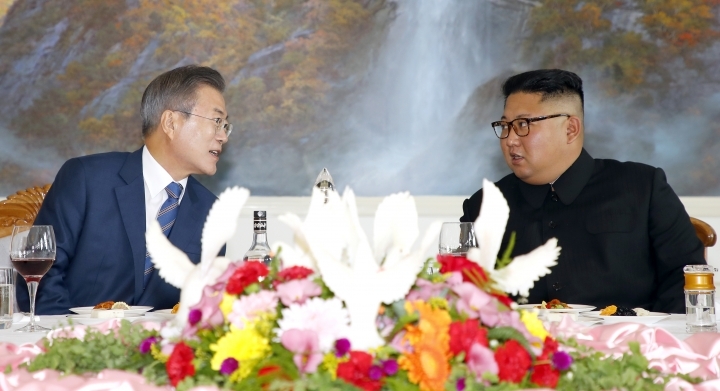 "They are full of substances ... and I think (the deals) would help make a contribution to the easing of tension," said Kim Taewoo, former president of the government-funded Korea Institute for National Unification in Seoul. "But they are all subordinate to (the nuclear issue)." Since the end of the 1950-53 Korean War, the two Koreas are divided along the 248-kilometer (154-mile)-long, 4-kilometer (2.5 mile)-wide Demilitarized Zone that was originally created as a buffer. But the area is guarded by hundreds of thousands of troops, mines and razor-wire fences on each side. The exchange of gunfire, bloodshed and deadly violence have occasionally occurred. Their poorly marked western sea boundary was also the site of several skirmishes, artillery exchanges and an alleged torpedo attack that killed dozens. Under the deals, the two sides would establish "buffer zones" on land and at sea, and a "no-fly zone" above the borderline to prevent accidental clashes. The Koreas would stop live-fire and field maneuver exercises in the areas 5 kilometers (3.1 miles) from the military demarcation line and in waters close to the maritime boundary. The countries also would put covers on coastal-based artillery guns. 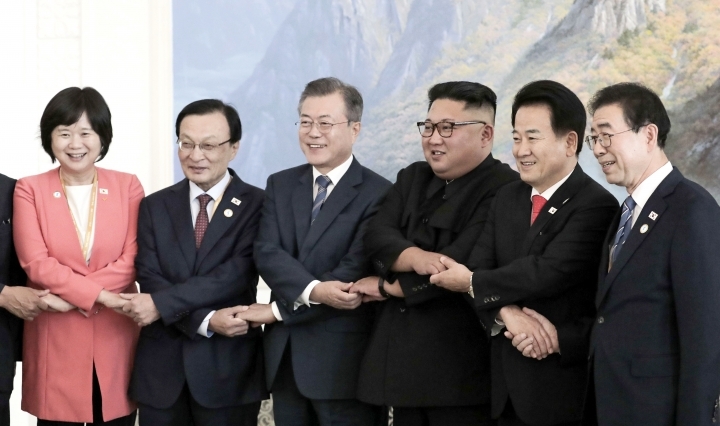 They also agreed to "disarm" their jointly controlled area at the border village of Panmunjom, the site of the past two Kim-Moon summits. It's also where North Korean soldiers sprayed bullets at a colleague fleeing to the South last November. According to Seoul documents, the Koreas would pull back weapons and guard posts in the area to let 35 "unarmed personnel" from each side guard the village and let tourists freely cross concrete slabs forming the demarcation line there. The deals also require both countries to withdraw 11 guard posts located within 1 kilometer (0.6 mile) from the military demarcation line by Dec. 31. The two Koreas eventually aim to withdraw all guard posts, where combat troops are stationed. The Koreas also decided to launch their first-ever joint searches for soldiers killed during the Korean War next April at a DMZ area where one of the fiercest battles happened. "I would say South Korea's national security will be weakened because the deals would equally reduce the conventional military might, where South Korea has a superiority over the North, without achieving progress in denuclearization," said analyst Shin Beomchul of Seoul's Asan Institute for Policy Studies. The Korean leaders agreed to pursue a joint bid for the 2032 Summer Olympics. They also plan to send more combined teams to the 2020 Tokyo Summer Games and other major sports events. For many South Koreans, it would be mind-boggling that the Koreas are even talking about sharing the Olympics. North Korea boycotted the 1986 Asian Games and the '88 Summer Olympics, both held in Seoul, and relations dramatically worsened on the eve of the Seoul Olympics with the North's bombing of a South Korean passenger jet that killed all 115 aboard in December 1987. The 1988 Games marked South Korea's arrival on the world stage as a modern industrialized economy and full-fledged democracy. The Winter Olympics earlier this year in the resort town of Pyeongchang provided the stage for a diplomatic breakthrough between the Koreas following a period of animosity over the North's nuclear and missile tests. It would be extremely difficult to host the Olympics in North Korea under heavy international sanctions, which won't be removed until the North takes concrete and verifiable steps to relinquish its nuclear arsenal. There's also a declining public support for hosting mega sports events in South Korea due to concern over costs. 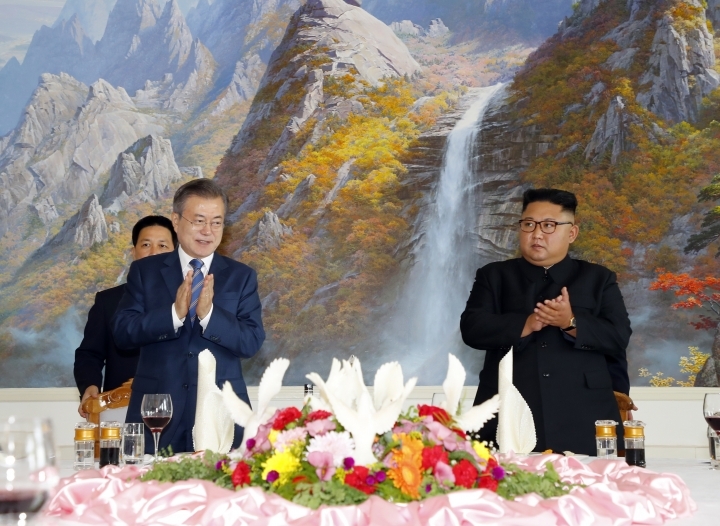 During the Pyongyang summit, the leaders also agreed on a Pyongyang art troupe visiting Seoul for performances in October and pushing to hold more reunions of elderly residents separated by the Korean War.